Desh is a cultural and literary magazine in Bangla. It is fortnight issue and published from Kolkata, West Bengal. Today I'll share with you a pdf file of Desh 17 April 2016. 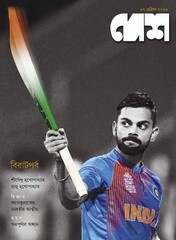 Cover stories are known about cricketer virat kohli, about science, Travel, books etc. Get the edition of Desh 17 April 2016 ebook pdf.